This wasn't originally going to be a rabbibunny in particular - just a bunny. By the time I finished, I figured it kind of gives an LBA feel. All done in Photoshop, over a matter of several hours. There may be some slight imperfections - I might fix them. Overall, I'm happy with the way it turned out. Come to think of it, the style reminds me of a lot of 2Dark's artwork. Hey. You have improved a lot. Nice shading and the transparency on the glasses. I like how nerdy she looks. Maybe she works at Mrs.Bloops museum ? Yes... Improving was a big goal of mine for a long time - glad I get to show it now. Thanks for the compliment. Maybe she does work at Mrs. Bloop's. 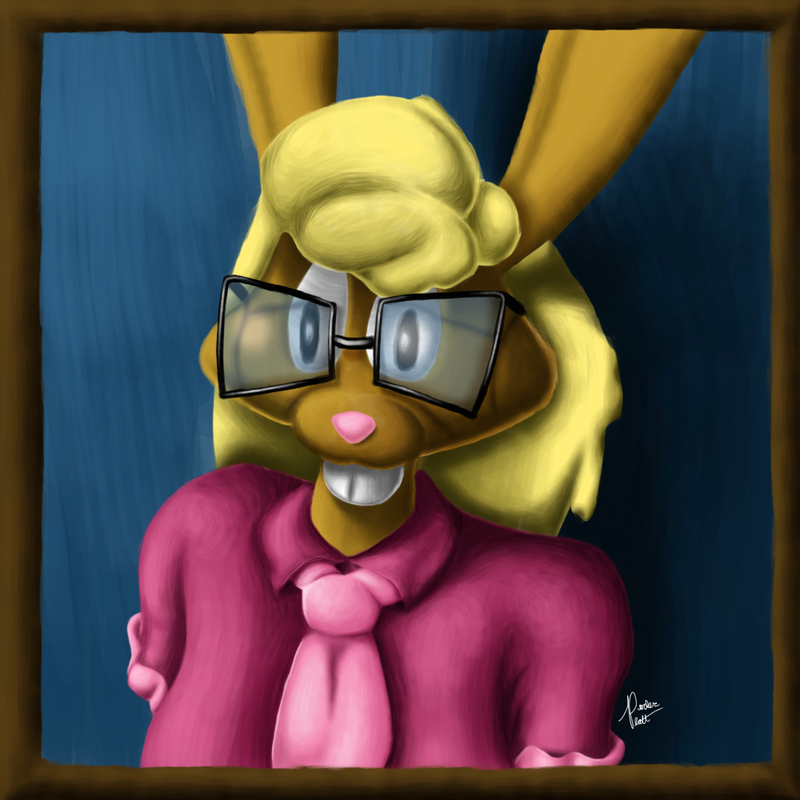 Yeah, very nerdy bunny. I apologize about the past, and if you hate me I understand. My real name is Parker Platt... I'm going to work extremely hard to make sure that name doesn't get tarnished. With the stupid things I've said in the past on the MBN, it's no surprise that some may not like my name anymore... Choosing "MrQuetch" was a retarded Username to begin with. And I chose it unwittingly knowing that "Quetch" already existed... When it comes to usernames I'm completely unoriginal and lacking. Last edited by MrQuetch; 2018-03-06 at 20:02. Thanks, Polaris. Yes, the colors bring an LBA feel. I was going for an 80's/90's style with the glasses. I don't think anybody really hate you. There were some more intense exchange of messages but you know in the end we all humans. Other thing is that from my personal experience our MagicBall community is not build from people that would hold some real grudges only because of that. This is why I like being here after all this time. Remember we are not define by mistakes we do but by lessons that we learn from this mistakes. I also wouldn't wory to much about your nick. My is as unoriginal as yours. For me the thing is what you want to present behind it. Now you put your real name behind it so do stuff the way you won't regret that because nick is easy to change and real name not so much. I don't hate you, dude. I dont know whos the current active admin now, but you can ask an admin to change your username.